This is an excellent way to use leftover bread. 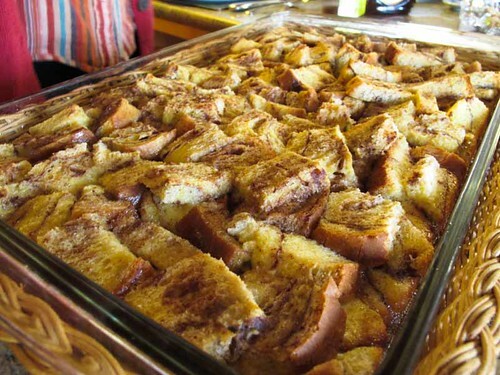 My grandmother use to look through the bread box and find bread that she would not use for any other reason except to do this French toast casserole. Also you can put this together the night before and refrigerated and then pop it in the oven the next morning. Slice French bread into 20 slices, 1 inch thick. Arrange slices in a generously buttered 9x13 flat baking dish in 2 rows overlapping the sides. In a large bowl, combine eggs, half and half, milk, sugar, vanilla, cinnamon, nutmeg, & salt. Beat with a rotary beater or whisk until blended but not too bubbly. Pour mixture over the bread slices, making sure they are covered evenly with the milk-egg mixture. Spoon some of the mixture between the slices. Cover with foil and refrigerate overnight. The next day preheat oven to 350.